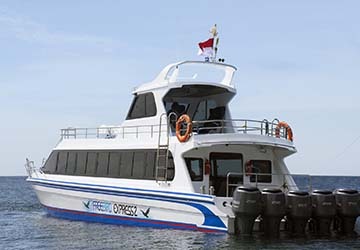 FreeBird Express, formally known as Pacha Express, is one of the newest high-speed ferry operators in Indonesia, offering routes between Amed in east Bali, the Gili Islands and Bangsal in northeast Lombok. With average journey times of just forty-five minutes to two hours, as well as safety and professionalism at the heart of their operations, FreeBird Express strives to deliver the highest quality of service for their guests and has become the largest and most luxurious boat servicing company in the Gili Islands and Lombok from Amed. On board their modern vessels, you’ll find comfortable seats, a spacious sundeck to admire the beautiful scenery and the latest range of safety equipment, so you can rest assured you’re in the best hands. Each passenger receives a free bottle of mineral water and a fresh towel, too, and the company provides a free transfer service from the Amed area to the harbour, as well as transfers from nearby areas for a charge. With directferries.com you can find FreeBird Express timetables, fares and book FreeBird Express ferry tickets. Where applicable we’ll also compare FreeBird Express with alternative ferry companies.